Ahoy from Agua Verde during Samana Santa! Samana Santa...what the heck is that? Well, in Mexico it's technically the the week before Easter but in reality they've stretched it into the 2 week period surrounding Easter.The kids are out of school and the beaches are packed with people camping and enjoying the beautiful weather. 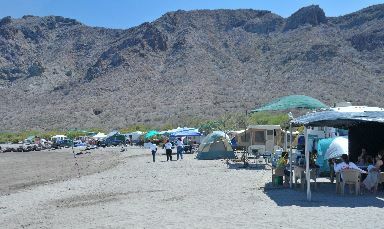 As last week progressed, the beaches increasingly filled with tents and people playing in the water. It's really wonderful to watch the locals enjoy this week. Last year we were in La Paz and had rented a car and spent Easter exploring beaches and enjoying the holiday with thousands of the Mexicans. Once again I'll point out how friendly the Mexicans are and how welcoming they are. Set aside all of the negatives that you hear/read in the US media and come down and enjoy this wonderful country! My last log came from Puerto Escondido and from there we moved a whole 8 miles to the SE to Los Candeleros. 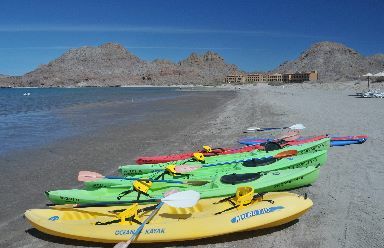 This anchorage has the nicest beach that we've walked on since we left Guaymas. The western end was packed with camping Mexicans who spread eastward as we were there. The beach was wonderful with soft sand and we enjoyed the almost mile long beach. On top of that, there's a beautiful hotel that graces the bay and provides amazing Internet access to cruisers. The area around Puerto Escondido probably has the most spectacular scenery in the Baja with 1000+ foot glowing mountains cascading to the Sea, but this extreme beauty extends for many miles on either side. I can easily see why people spend so much time cruising this area! I must also say that the climate at this time of year is delightful with lows around 60 and highs in the low 80s and it's very dry. The only think that I'd change is that the water is still cold at around 70F and much colder when you're diving. From Candeleros we moved about 17 miles SE to Agua Verde, which for those of you who remember last year's posts, was where I shot a some great video of a Whale Shark. 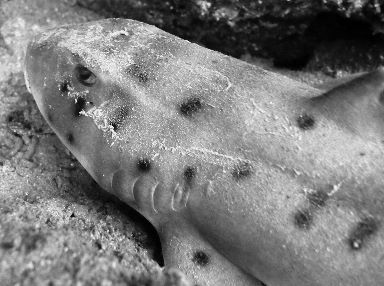 We didn't have any Whale Sharks this year, but I did manage to get in 2 dives where I saw several Mexican Horn Sharks, which I've never seen before. That was quite exciting for me, even though these sharks are very docile. Unfortunately this also emphasized to me that I don't have some necessary equipment to do underwater strobe photography since attempting to switch my dive camera over to a new system. Arghhh! I don't know where it is, but it isn't on board. Tomorrow we're headed about 18 miles SE from here to an anchorage called Puerto los Gatos where we stopped last year for lunch. It also has spectacular rock formations, so I'm looking forward to seeing it again. In Candeleros we anchored at 25-43.39 N, 111-14.2 W in about 15' over sand with good holding. The beach to the W of the hotel was much nicer than that to E.
In Agua Verde we anchored near the beach in the N end in 20' and ran a stern anchor towards the beach to keep us into the swell.